Muffle Furnace is manufactured and supplied by our company, with the features of stable high temperature. We make Muffle Furnace available in three different working ranges with temperature range up to 1150Â°C. 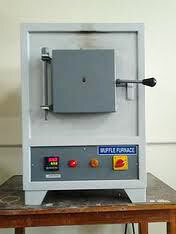 We make Muffle Furnace at the best prices in the market. Our design of Electric Muffle Furnace is instilled with the safety feature of Overload safety cut-off provided as a standard feature and triple walled unit for better thermal safety. Outer and intermittent walls are made of thick P.C.R.C. sheet, duly powder coated. Heating elements are made of KANTHAL â��A-1â�� grade wire. With the distinguished Auto tune Digital P.I.D. controller, it provides precise control of temperature. By the highly efficient heater installed in the chamber, it heats the materials uniformly. With this excellent feature, it surely reduces time of temperature climb.